Two US-companies want to push the development of a wireless implantable glucose sensor on RFID-basis. No later than 2008 they plan to present a device working for a minimum period of 6 months. 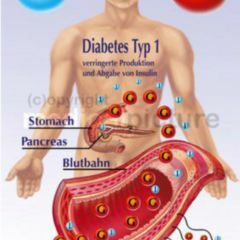 It is the holy grail of diabetes-therapy: the automatic pancreas. 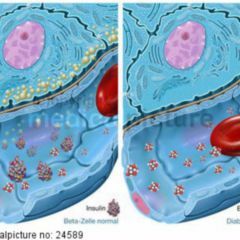 The carrier does not have to worry about a thing because the level of glucose is measured continuously and the attached insulin pump reacts automatically. The pump is not the issue. The reason why there is no system on the market working satisfactorily: The glucose sensor. It might gum up, infect, create unwanted blood clots etc. To sum it up: It's a nuisance with the technology. In times of microtechnology, still millions of glucose test strips are going over the pharmacy counter. Many tried to dry out this business: "There is a remarkable number of failed developments and system", Lutz Heinemann of the Profil Institut für Stoffwechselforschung in Neuss sums up. Just recently Heinemann compiled facts for a lecture – a depressing proof of failure. Time and again there are reports about non-invasive "glucose watches" such as GlucoWatch or Pendra. But they did not make it, either because they are not exact enough or give skin irritations or they suddenly fail to function if the carrier starts sweating. Invasive systems fail in series as well – despite good basic approaches such as microdialysis technology as for example the one used in the SCGM-1-System of Roche Diagnostics. In the end it was a lack of maturity and turning the product into a success on the market became too expensive. All this does not necessarily mean that quite a few companies were not trying to take steps forward. Recently Medtronic, a manufacturer of insulin pumps, has announced the introduction of a pump for continuous invasive glucose measuring in mid May. The MiniMed Paradigm REAL-Time-System is known as the first pumping system with the option to continuously measuring blood glucose. 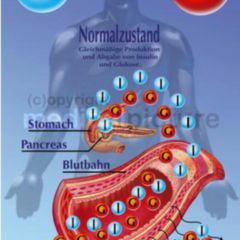 It contains algorithms calculating the necessary amount of insulin thus at least getting closer to the "automatic pancreas". Nevertheless: the glucose sensor is the sting in the tail for Medtronic as well. It is positioned subcutaneously and has to be replaced every three days. Better than nothing but still annoying. 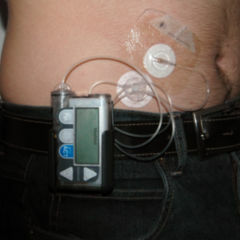 The sensor communicates wireless with the insulin pump. Not just three days but at least six months – that is how long a novel glucose sensor is supposed to function. It is injected in the subcutis and transmits information by Radio Frequency Identification (RFID). The sensor is developed by two companies specializing in RFID systems: Digital Angel Corporation and VeriChip Corporation. The majority of both belongs to the technology group Applied Digital which is renown for digital security technology. 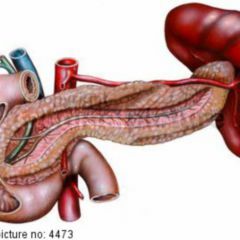 VeriChip however is the one with the experience in healthcare. This company tries with a massive public presence to convince patients of the blessings of implantable RFID chips thus providing physicians with access to a web-based health file. The company informs that they equipped 600 American hospitals with RFID scanners free of charge. The use of RFID-based sensors could have some advantages compared to other methods. The passive RFID technology enables a very small implant because the implanted chip draws its energy from the radio impulses reading it. And RFID based communication is known to be relatively immune against disturbances. But RFID-communication does not solve the issue with the sensor neither. So, high expectations seem to be out of place. For pharmacists it is definitely too early to cancel their orders for glucose test strips.